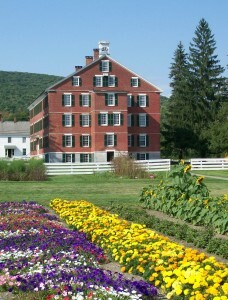 Built in 1830, the Dwelling housed 100 Brethren and Sisters in a communal dormitory setting. It contains unique and efficient design elements such as “sliding cupboards” (dumbwaiters) and “borrowed light” windows placed on interior walls and ceilings to distribute sunlight and fresh air throughout the large structure. The construction reflects the Shakers’ principles of celibacy and equality for all members: It is divided in half, with Brethren and Sisters using separate doors and stairs at all times. 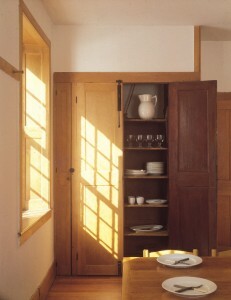 The Brick Dwelling houses the largest portion of the Village’s collection of Shaker furniture and other artifacts, as well as the efficient built-in cupboards, drawers, and peg rails. Rooms available for viewing include sleeping quarters, dining rooms, state-of-the-art kitchen, food storage rooms, meeting room, and other room settings illustrating aspects of Shaker daily life circa 1840-1850. On your tour, you will see fine examples of Shaker household items and learn their history and what they tell us about Shaker life. A 20 – foot dining table adapt ed for use in the laundry speaks to the communal nature of Shaker life. Rare adult cradles used to soothe the elderly and infirm, and smaller-scale furniture used by Shaker children illustrate the age diversity of the Shaker “family.” Nests of oval boxes, candle stands, and a large number and variety of Shaker chairs and tables grace the room settings of the Brick Dwelling. The Millenial Laws, a body of religious laws meant to bring the different communities into uniform practices, in 1845 prohibited Ministry from eating, living or working with the rest of the people. They specified furnishings for the bedrooms and prohibited a “looking glass” from being larger than 18″ long by 12″ wide.